I hope some of you find this work interesting, the code with the control algorithm (Segurado and Llorca, 2004) to avoid convergence problems in cohesive zone model analyses of crack propagation can be downloaded from empaneda.com/codes (documentation and Abaqus input files are provided). Are there any papers/documents on one dimensional bar problem with a cohesive zone element formulation? It should be a zero length non-linear spring in this case right? I am more interested in setting up the problem from the virtual work principles rather than a discussion of the results. A Postdoctoral fellowship is available at The Johns Hopkins University, Baltimore, U.S.A. in the area of fracture and fragmentation under dynamic loading conditions. The potential candidate should have a Ph.D. in an engineering discipline, a strong background in fracture mechanics and extensive computational modeling experience working with the finite element methods or some other numerical method with application to solid mechanics. I'm now start to learn cohesive zone model based FEM for crack problems. According the a regular coehsize model (bilinear for example), the relative displacement and the cohesive stress are both unknwon, so iteration is required. My question is that what are the regular iteration steps? I have been working on solving contact problems relating to fibrillar adhesives over the past 3 yrs of my PhD work. In the past, I used Comsol FEM to model contact interactions by implementing the Dugdale-Barenblatt traction separation law at the contact interface. The shape of the layer is a quarter circle. When modelling this i first create a cohesive layer with a certain thickness. I then convert the part of this cohesive layer to a orphan mesh, then edit the mesh, such that a zero thickness layer is created. What is the difference betwee a failure criterion and a yield condition? Read more about What is the difference betwee a failure criterion and a yield condition? European Commission' s JRC (Joint Research Centre) is organizing the 2nd workshop on physics based modeling of material properties and experimental observations in collaboration with TOBB University of Economics and Technology. The workshop will be held in Antalya/Turkey on 15-17 May 2013, and the special focus will be fracture and damage mechanics. I have some problems with contact elements in ANSYS. My model is a cube of matrx containing two fibres with periodic boundary conditions. The interface between Matrix and Fibre is modeled with contact elements and cohesive zone law. I am Ravi dalmeya doing Phd from Indian Institute of Technology,Kanpur (India). I am doing work on adhesive elastic wavy thin film. I have completed 2-D Hertzian contact between cylinder and elastic half space using Abaqus. Now i want to apply Dugdale-Barenblatt cohesive zone model outside the contact zone and i do not know how to apply Dugdale-Barenblatt cohesive zone model outside the contact zone.Can you give me some suggestion? Could you, please, help me with the following issue? I’m trying to simulate a crack growth in an anisotropic media using cohesive zone model (CZM), and the results I get do not agree with my expectations, based on a common sense and simple estimations. As I don’t yet feel myself on a safe ground with APDL, I make use of Ansys Mechanical, implementing command objects where needed. Can anyone suggest some basic literature on Cohesive Zone Modeling and it's implementation through FEM? Most of the literature, I find, is on traction-separation behaviour and some simulation using a FEM package. I 'm interested to learn it's mathematical formulation and implementation through FEM. Can anyone help me? I modelled a beam with a hole and used cohesive elements on the possible crack plane. When I run the model in 2D, it works very well and I can get the results pretty good. Problems with cohesive zone. Does it make sence to use them here? sense to use cohesive zone models? seems taht the whole force/displacement is lost in the cohesive zone. Read more about Problems with cohesive zone. Does it make sence to use them here? (for completing R. Huang's post : node/7396). A few years ago, some colleages (from Italy, UK and Brazil) and I proposed some comparisons of the behavior of cohesize zone models. This was presented during ECCM 2004. The paper is attached. I'd like to ask if anybody knows if it is possible to use an ABAQUS usersubroutine that could vary some parameters (τmax, kn or ks etc) of the cohesive zone model of ABAQUS with the vertical pressure applied on the interface. The new ability of ABAQUS to support cohesive behaviour in contact surfaces seems very interesting and useful, however how could somebody simulate the interface under a compression - shear regime that may follow a Mohr-Coulomb type behaviour? How to implement the Cohesive Zone Model in COMSOL? 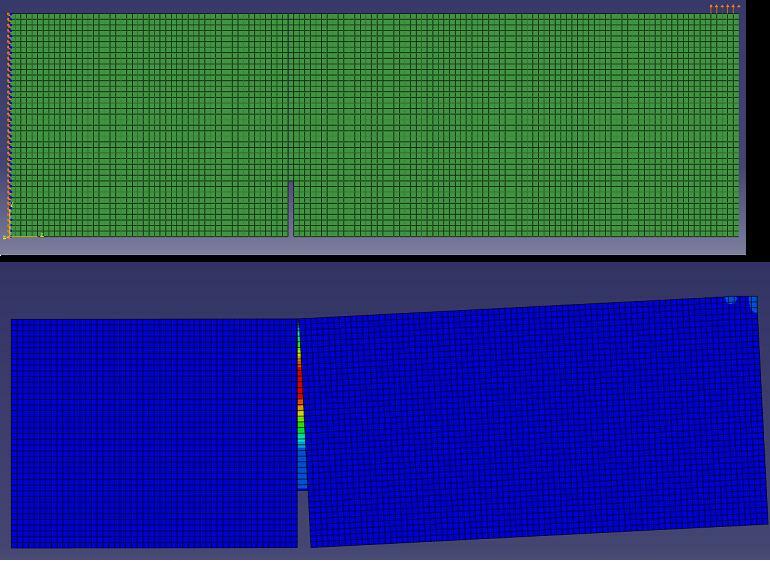 I am trying to simulate a three-laminated composite considering the cohesive effect between the interfaces. How can I implement this in COMSOL? Are there any Samples to follow? Read more about How to implement the Cohesive Zone Model in COMSOL?